NordenBladet – Her Majesty’s sepulchral monument is now set up and stands in Saint Bridget’s Chapel at Roskilde Cathedral. Here, The Queen will be laid to rest alongside nearly 40 Danish kings and queens from the early Middle Ages until today. The preparation of the monument has been underway since 2003, when the sculptor, professor Bjørn Nørgaard, was commissioned to create a modern sepulchral monument that can be incorporated into the large number of royal grave monuments at Roskilde Cathedral. From the project’s beginning, Bjørn Nørgaard was in close dialogue with The Queen and Prince Henrik about the idea and the design of the work “Sarcophagus”. The artwork represents The Queen and Prince Henrik’s joint efforts through 50 years, and The Prince’s decision to not be entombed at Roskilde Cathedral has not brought about changes in the artwork. The base is crafted in sandstone from France, and the three pillars supporting the sarcophagus are of Danish granite, Faroese basalt and Greenlandic marble, respectively. The elephant heads on the pillars are cast in silver. 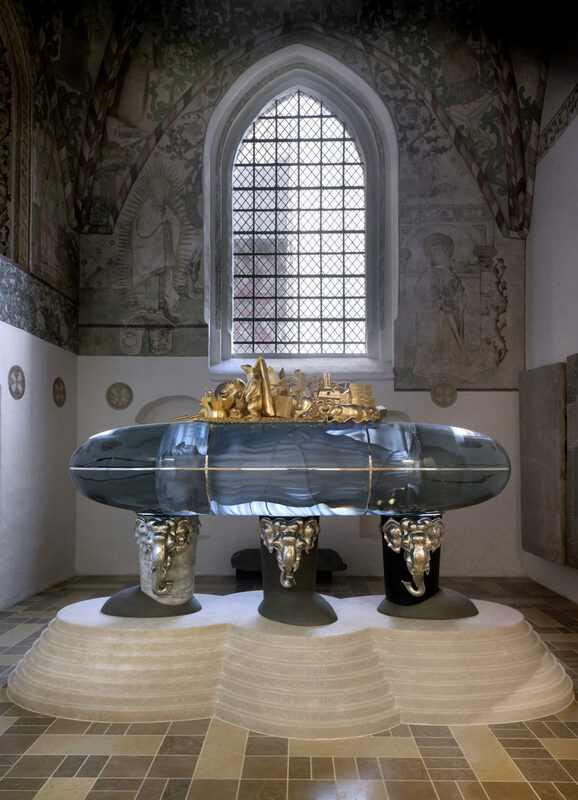 The sarcophagus itself is of cast glass, and, in a hollow space in the glass, two figures representing The Queen and Prince Henrik are sand-blasted on the inner side. Allegories, heraldry and symbols in gilded bronze are found on the top. The Queen will be laid to rest in a crypt under the sepulchral monument. As the sepulchral monument will first be displayed to the public after The Queen’s death, a covering has been prepared so that visitors to the Cathedral will have a chance to visit the chapel, even though the sepulchral monument has been set up. Both the sepulchral monument and the covering are by Bjørn Nørgaard, and a 1:10 copy of the monument is exhibited in Roskilde Cathedral, where visitors can follow the crafting of a modern sepulchral monument through information boards and a coming exhibition, which is expected to be opened at the end of June. The work and the costs of the monument have been held within the Danish Parliament’s stipulated appropriation under the Budget Act. Since the 1400s, Roskilde Cathedral has served as the burial place for the Danish Royal House. The sepulchral monument enters into a long tradition of inscribing an epitaph in Roskilde Cathedral to the sovereign’s life and deeds.